"Everyone is psychic; it is our sixth sense which utilizes thought vibrations to obtain information. " There are many haunted places in Florida. If you are interested in experiencing the most mysterious real haunted places in the Sunshine State, you should take a trip to the city called Cassadaga. The word “Cassadaga” means “Water beneath the Rocks” according to the Seneca Indian. This particular community was established in Volusia County and is considered to be unincorporated. This means that the land that the community sits on is not considered to be a part of any one particular municipality. In other words, the community has its own unique government system in place. The city has its own unique social based identity. This mysterious town is known to host a number of spirits as well as a large amount of individuals that claim to be psychic. It has been hailed as the “Psychic Capital of the World”. If you are interested in haunted places in Florida, Cassadaga should draw your interest. In the year of 1894 a man named George Colby founded the town of Cassadaga. In the year of 1879 Mr. Colby received his official baptism at a well-known spiritualist camp identified as Lily Dale. This was located in the State of New York. He was baptized in a lake that was located at the spiritualist camp in New York named “Cassadaga”. As he was being baptized, it has been attested to that he had a vision of creating another spiritualist camp. Mr. Colby, also known as a “Seer of Spiritualism”, traveled to many different locations. He gave account to the fact that one of his famous spiritual guides, who was an Indian of the Seneca tribe, instructed him to travel to the State of Florida. When he arrived, he found that he was in an area identified as Blue Springs Landing. He arrived in the State of Florida in the year of 1875. In the year of 1895, he was given permission to form what is referred to as “The Southern Cassadaga Spiritualist Camp Meeting Association”. He then signed a land deed that permitted him use of thirty five beautiful acres of land. The name “Cassadaga” was given to the land as it was based on the spiritualist camp in New York. Today, the camp has blossomed to an amazing fifty seven acres of land and a population of nearly four thousand individuals as of the year 2009. In the year of 1991, Cassadaga was issued an official designation on the registry known as “National Register of Historic Places”. It has also been established that the “Southern Cassadaga Spiritualist Camp Meeting Association” is not only the oldest but also the most active religious based community in all of the Southeastern region of the United States. There are many individuals that own the actual structures that they reside in, but the land of this community is all under the ownership of the church in the camp. The individuals that reside in this community or move to this community are typically involved in the movement identified as the “New Age” or the people that want to empower themselves and live a life that is responsible and contributes to the world in a positive manner. Most all of the residents believe that their community is one of the most haunted places in Florida. 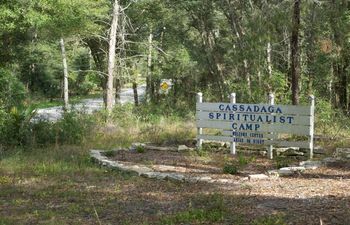 When it comes to ghosts and other types of spirits, Cassadaga is considered to be a spiritual hot spot. This is because several individuals believe that it is literally a spiritual vortex, or a location where the plane that is identified as physical and the plane that is identified as spiritual is closer than usual. The basic spiritualism that occurs in the community is likely why this is considered one of the most popular haunted places in Florida and is likely the sole reason it is considered to be one of the most haunted places in Florida. The members of the community and those that have visited Cassadaga believe that there are several real haunted places in and around the community. The residents of this small, quaint community consist of those that claim to be psychic, healers, and there are also many that claim to be clairvoyant. Many individuals claim that they have spiritual guides and are able to communicate with the deceased and other entities from the spiritual plane. When visiting this Florida city, you feel a sense of calm and a sense that you have stepped out of the world that you know into an unknown, but pleasant world. Many individuals that have visited haunted places in Florida claim that Cassadaga is the one location where spirits seem to abound endlessly. Many have captured haunted videos, ghost pictures, and even disembodied voices on special ghost hunting equipment such as digital voice recorders. It is not at all uncommon to capture a picture of rich ectoplasm, a fleeting glimpse of a shadow from the corner of your eye, or to visually experience orbs floating in the area of various colors. You may feel an occasional burst of cold air, may feel an unexpected breeze, or you may get lucky enough to experience a full body apparition firsthand in Cassadaga, Florida. Many have experienced paranormal events in the Cassadaga Hotel. Many have experienced unusual situations around the lake known as Spirit Pond. To the south of this pond, many claim to have experienced ghosts firsthand near the cemetery. This is located on the road identified as Kicklighter. If you are interested in the paranormal and the mysterious world of the spirits, there are many haunted places in Florida but the real haunted places located throughout Cassadaga, Florida are the most prevalent. Is this really a portal to the spiritual world? We may never know that answer, but we do know that this is one of the most popular real haunted places in America. If you are interested in exploring the spiritual side of Florida, the residents of this community are friendly and welcome you to their spiritual realm.